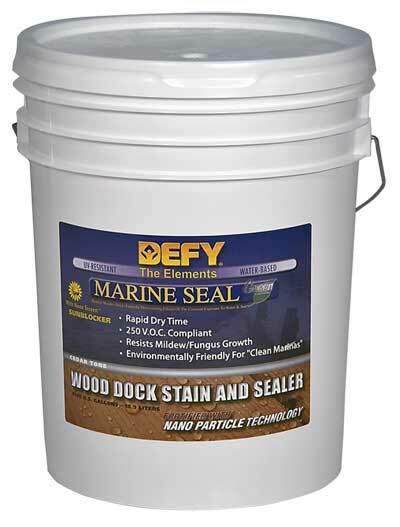 DEFY Marine Seal is suitable for use on all types of wooden docking materials, providing extreme durability against the harmful effects of exposure to both fresh and salt water. DEFY Marine Seal has been specially formulated using state of the art nano-particle technology to provide superior resistance against ultraviolet color fade and mold and mildew growth. 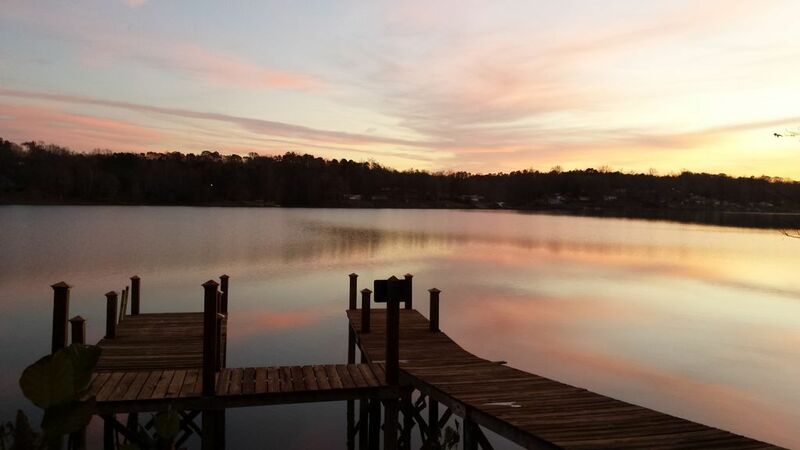 New cedar docks should be cleaned as quickly as possible to avoid damage from the sun and rain. Let oil-rich woods such as mahogany weather 6 months prior to application. New pressure treated lumber typically contains a high degree of moisture and should be allowed to weather for 6-12 months prior to staining. * Environmentally Friendly for "Clean Marinas"
To achieve optimum results, DEFY Marine Seal should not be applied over previously stained surfaces, painted surfaces or varnished surfaces. When staining composite lumber and exotic hardwoods, allow materials to weather for no less than 12 months. 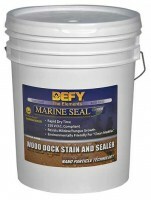 Prior to staining, clean all surfaces with DEFY Marine Seal Wood Dock Cleaner per label instructions. For all composite wood and exotic hardwoods, apply only one coat of stain. Note: The "wet" color of DEFY Marine Seal has a cloudy/milky appearance but will dry to a beautiful, semi-transparent finish. 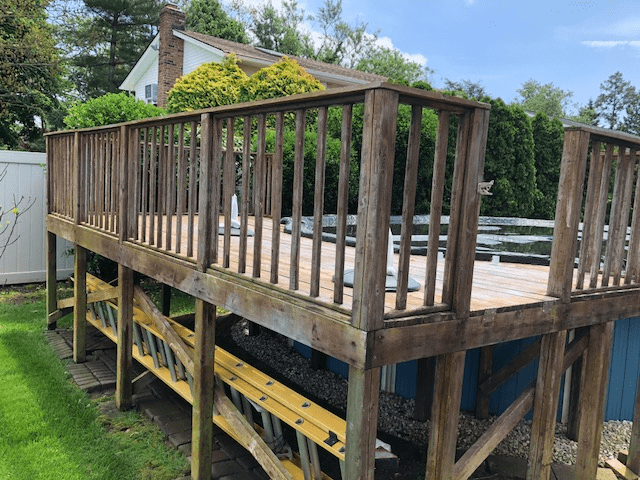 26 years of deck cleaning and staining experience in Maryland . I moved to Murrells Inlet SC to retire and I want to help my friend start a business washing and staining docks and piers . I found your product in my search for a marine grade semi-transparent stain that can handle the salt water and UV sun in this area . Wash , brighten and apply stain seems to be the procedure here as well . What else can you recommend for this start up business ? That is all you would need as far as materials from our end unless there is an old semi-transparent coating that needs to be removed with our Defy Stain Stripper. We stained our pier maybe 5 years or more with just Thompson seal from Lowe's right after it was pressure washed. It has been stained only twice since it was built, around 1995 with salt treated lumber from our local H & B Lumber here in Statesville, NC. Really no issues with it, just wanting to protect it a little better and will use whatever you recommend! The Defy Marine Stain is the best product for this. Reason for Previous Stain Failure: Faded and mostly gone. Done poorly by a hired contractor. You do not need a dock stain for this. Try the Defy Extreme Stain or the TWP 1500 series. What do you recommend for application? I see DEFY makes a push brush head that is 11” wide but I cannot find this product on your site. Not sure what you mean by "space"? Since it has been a year, you are ready to prep and stain. You can do now in these temps. Use a deck stain pad for applying. 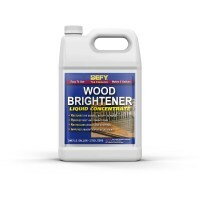 Can I use the Defy Extreme Stain for a redwood deck at the beach? once frozen can the stain be reconstituted? For two coats, about 500 sq. feet. For one coat, about 750 sq. feet for the 5 gallon. Howdy, How many square feet will a 5-gallon bucket cover? Thanks! This would be the correct product for this. I have a 12 year old PT wood dock over salt water. Which product do you recommend to refinish it? I would use the Defy Extreme Stain for a pool deck. would the defy marine sealer work well on my pressure treated swimming pool deck? If so, about how long will it last? Would there be a better product than this for my deck? I would stay with Defy Hardwood Stain for IPE. I used Defy Hardwood stain on a dock with IPE wood, and it did well. It's time for a redo. Should I continue to use the Hardwood stain, or switch to this Marine stain? Yes you can apply while over water. Can I apply this while my dock is in the water? I would not be able to contain all of the spillage. Typically every 2-3 years on a horizontal surface. You can clean and recoat when needed as long as it is the same product. It is water-based. Shipping to Maryland is 3-5 business days. Return policy is at the bottom of the page.